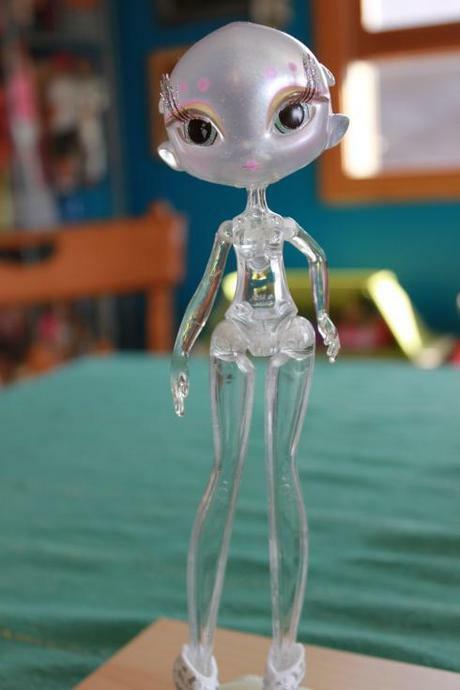 I'd like to make a future custom where the doll itself is "invisible", and was wondering if anyone knew if the entire doll had the translucent effect or just the lower arms/legs. Like as an example, Lagoona's hands (at least for the originals, I think the reboot is different) are translucent with skin paint on the hands, leaving the webbing clear, but the rest of the body is standard plastic. Spectra has lower arms/hands and legs/feet making a white to translucent gradient, are her torso and upper arms/legs translucent as well? Same question for Billy; just wanting to find this out before I start scrubbing at the body and potentially ruining something. Thanks! The Spectras I've had had solid white torsos and upper legs/arms (and I drilled holes/took apart articulations, so I saw all the way through). No idea about Billy, though! Unfortunate! I was hoping to get a translucent stomach along with the forearms. Not sure if Billy's blue would work as well as Spectra for my hopeful project, even though it was going to be a male. I'll see what I can work with. Thanks all! Using an Inner Monster might help? I was thinking about that, but as far as I'm aware, none of them are white-clear, they're like pink or blue (or am I thinking of the CAM Ice and Blob girls?). I'd prefer to have no color tint, which is where most of the difficulty stems from, but I could probably make it work with just clear forearms. Thanks for the suggestion! Yes, Blob & Ice are pink & blue. I have an orange Inner Monster torso, not sure about the rest of that line. If you wanted to branch out past MH, there's those models of the human body with the inner organs, lol. For Spectra it's only her arms hands and legs. You might have some luck with aliexpress if you're looking for a girl doll body. They have all sorts of clone bodies. They're smaller but Gail Lexi and Cici are the more mature bodies I think? Had to check with mine heh.